Over 400 router bits from BOSCH, FESTOOL and other manufacturers, for wood, metal and other materials processing. Use router bit type, manufacturer, shank diameter filters. 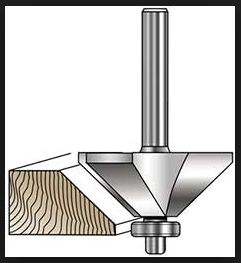 Choose a router bit with or without bearing. This type router bits usually are used to cut beveled edge on profile working on different projects. Most router bits are for wood or laminate cutting. Usually such type bits have ball bearing for precise support. Chamfer bits very often are used to create angled edges during box construction. If you want to make 4 – sided box, use 45o bit, for a 6 – sided box you need 30o bit, for 8 – sided box 22,5o chamfer bit is necessary. Despite the simple construction of straight router bit, this versatile cutter can be used in a very wide range of applications. It can be used to cut grooves, make dadoes and rabbets, make seats for hinges, rout specially shaped holes, cut round holes wiht clean edges, shape and duplicate parts using prepared templates. 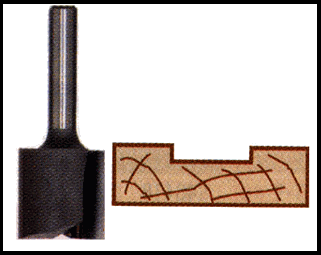 Straight router bits can have different sizes, lenghts and patterns, but they can be divided into straight bits (such bit have blades only on its sides – it is impossible to plunge it into worpiece) and straight plunge bits (this tyoe of bits have blade on its tip, therefore you can make a plunge cut). Trimming bits usually have bearing guidance. Such bits are used for shaping identical parts using template. 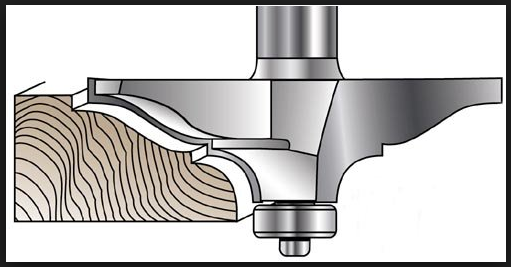 Support bearing rides along the templates surface and cutter trims workpiece to match it the template. You can choose router bit with supporting bearing mounted over, under or at both sides of bit cutting surface. 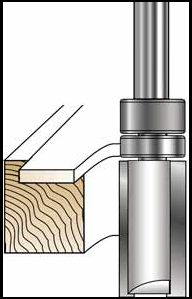 Ogee router bits are used for edge profiling. There is extremely wide range of different profile shapes you can choose from. It depends what shape you prefer and what kind of edge you are going to profile (for example: table leg, table top or drawer front part). Ogee bit can have support bearing, or not. It depends on the shape and type of router bit. During routing process always perform it in such manner, that workpiece feeding direction is opposite to the router bit rotation direction. This will ensure accurate tool handling and excellent results. If router bit rotation and worpiece feeding directions are the same, it will be difficult to control cutting process and machined surface will have lower quality, because rotating bit „pulls“ the workpiece and it tends to „jump“. WARNING: Never attempt to work with a router bit using screwdriver or drill. It is possible, but not correct and very dangerous! The router bit with sharp teeth / blade is very aggressive on the surface to be machined, so the router bit must be controlled very precisely, tool always must be stable. Cases when you loose control of tool and router bit suddenly jumps out of material can cause serious injuries and damage your workpiece. That is why special tools – routers are used for such applications. - router bits, specially designed for use with screwdrivers and drills.